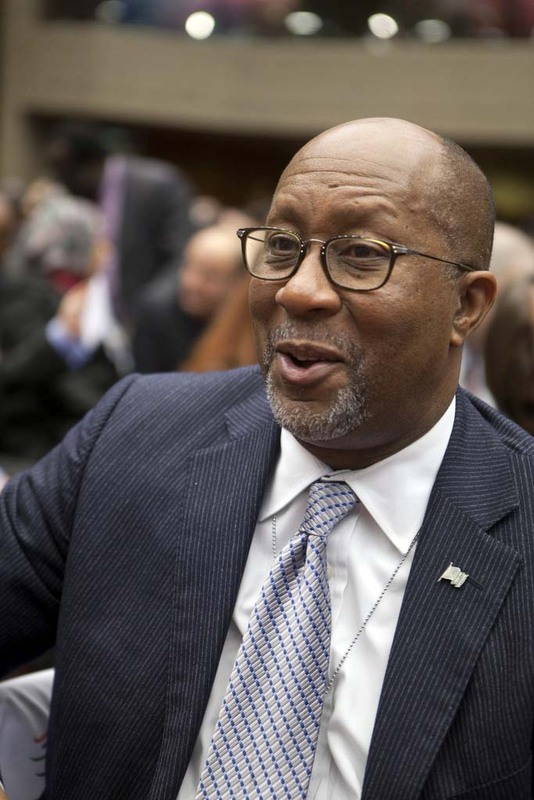 Ronald “Ron” Kirk is the U.S. Trade Representative for U.S. President Barack Obama. Kirk was confirmed by the U.S. Senate on March 18, 2009, and officially sworn in two days later. Kirk is the 16th trade representative and the first African American to hold the Cabinet-level post. As trade representative, he serves as the president’s principal trade advisor, negotiator, and spokesperson. He is also responsible for the development of U.S. trade policy and the oversight of existing trade treaties such as the North American Free Trade Agreement (NAFTA). Kirk was born in 1954 in Austin, Texas. He received a BA degree in political science and sociology from Austin College in 1976 and then went on to the University of Texas Law School where he received a J.D. three years later. While attending law school, he accepted an internship with the Texas Legislature. After graduating, Kirk worked for Democratic Senator Lloyd Bentsen of Texas as an aide and later was appointed Texas Secretary of State by Texas Governor Ann Richards, also a Democrat. In 1995, Kirk, in his first bid for public office and with major support from the local business community, ran for mayor of Dallas, Texas. He won a landslide victory, securing 62% of the vote to become mayor. During his mayoral campaign, Kirk promoted racial harmony in a city that had experienced considerable racial tension. As mayor, Kirk promoted the development of a $230 million sports arena and a $256 million urban renewal project to revitalize the Trinity Corridor on the edge of downtown Dallas. Both projects were criticized by skeptics who claimed he promoted downtown business interests at the expense of basic city services and neighborhood development. Kirk overcame the criticism to win an overwhelming victory in his 1999 re-election bid. He defeated his opponent by a 2 to 1 margin. In 2002 he ran unsuccessfully for the seat of retiring U.S. Republican Senator Phil Gramm. During the next six years prior to his confirmation to the Obama administration, Kirk worked for the prominent Texas law firms of Gardere Wynne Sewell LLP in Dallas and Vinson & Elkins LLP in Houston. He also served as an energy company lobbyist. “United States Representative Ron Kirk,” Office of the United States Trade Representative, http://www.ustr.gov/about-us/biographies-key-officials/united-states-trade-representative-ron-kirk; Alston Hornsby Jr., and Angela M. Hornsby, From the Grassroots (Montgomery, AL: E-Book Time LLC, 2006).